The choice of the front brake system is predetermined by the choice of the fork: if the fork is for two calipers, then the system should ideally be on two brake discs as well. We put the KYB 43mm fork from the Yamaha XJR1300 13+ for two calipers, and decided to assemble the suitable system. A good braking system, regardless of manufacturer, is expensive. 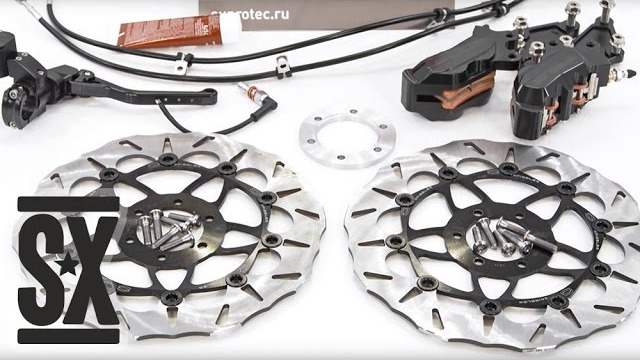 We chose the Spiegler brake master and calipers with floating brake discs ABM, because they perfectly match the controls and fit into the design of the motorcycle. The ABM brake master has a complete set with an integrated brake box (there are no problems with mounting the box on the clipon), a bending lever with an interchangeable tip (it is expensive, liveness when falling is important), shoulder adjustment (two eccentric positions) and looks great in combination with the Spiegler clutch machine. Two 4-piston Spiegler calipers fit the 20 mm machine perfectly. It is attached to the fork via LSL adapters for a 300 mm brake disc, which you can order from us. When mounting calipers, it is important that the bolts are jacketed. We did not find suitable bolts for sale, so we made them out of some longer ones. The front wheel hub from the Yamaha SR500 fits the brake rotors from the Yamaha TRX850 - they are exactly 300 mm in diameter. In order to center them in calipers, we had to make 7 mm spacers (for other calipers, the thickness may not fit). Because of the spacers, the standard mounting bolts from the TRX850 are not suitable, as they are too short. We made bolts using the ones from Kawasaki Versys 1000 - we needed to grind off the jacket to 8.4 mm. We had to make a new wheel on the new hub instead of the standard one - non-standard spitting, additional costs for the hub. To center the brake discs spacers are needed - you have to do them yourselves. For mounting the brake discs, you need long M8 bolts with a 8.4 mm jacket - you have to make the bolts from Kawasaki Versys 1000. For mounting calipers and brackets you need M10 bolts with 1.25 and 1.5 threads, 30 and 25 long, with 10 and 15 mm jackets — you need to make them from some longer ones. The system as a whole is more expensive, because one extra caliper and one extra disk are needed, plus it is impossible to leave the standard machine.